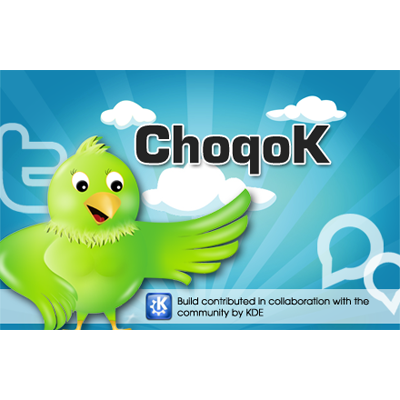 Choqok is a Free/Open Source micro-blogging client for K Desktop Environment. This open source micro blogging tool supports some of the well known platforms like Twitter.com, Identi.ca micro-blogging service, self hosted StatusNet websites, Open Collaboration Services API (Used by opendesktop.org) and you can send and receive direct messages. Flickr, ImageShack, Twitpic, Twitgoo, Mobypicture and Posterous photo uploading. Support for shortening urls with more than 30 characters. Post text translation using Google Translate service. Posts (Statuses) list appearance configuration. Filtering supported to hide unwanted posts. Preview Images from Twitpic, YFrog, img.ly, plixi, Twitgoo, TweetPhoto and etc. services. Preview Videos from YouTube and Vimeo services.